Yesterday we had this great opportunity to visit the Rashtrapti Bhawan – The Presidents House. I had sent an email to the President few days back requesting permission to allow us a visit to see this beautiful mansion with 340 rooms and 4 floors. To my pleasant surprise I received a call from Her excellencies secretariat on Saturday that our request has been accepted and so we set of to see this magnificent structure yesterday on 28th July. After going through three levels of security we reached the reception. After completing the formalities there our guide took us to see the place frm inside. The present day Rashtrapati Bhavan was the erstwhile residence of the British Viceroy. Its architect was Edwin Landseer Lutyens. The decision to build a residence in New Delhi for the British Viceroy was taken after it was decided in the Delhi Durbar of 1911 that the capital of India would be shifted from Calcutta to Delhi in the same year. It was constructed to affirm the permanence of British rule in India. This building gave the impression, in the words of a critique, the setting of a perpetual Durbar. The building and its surroundings were supposed to be ‘an empire in stone’, ‘exercising imperial sway’ and containing in it, “the abode of a disinterested elite whose rule was imposed from above”. That ’empire in stone’ and the perpetual Durbar was transformed to be the permanent institution of democracy on 26th January 1950 when Dr. Rajendra Prasad became the first President of India and occupied this building to preserve, protect and defend the Constitution of India. 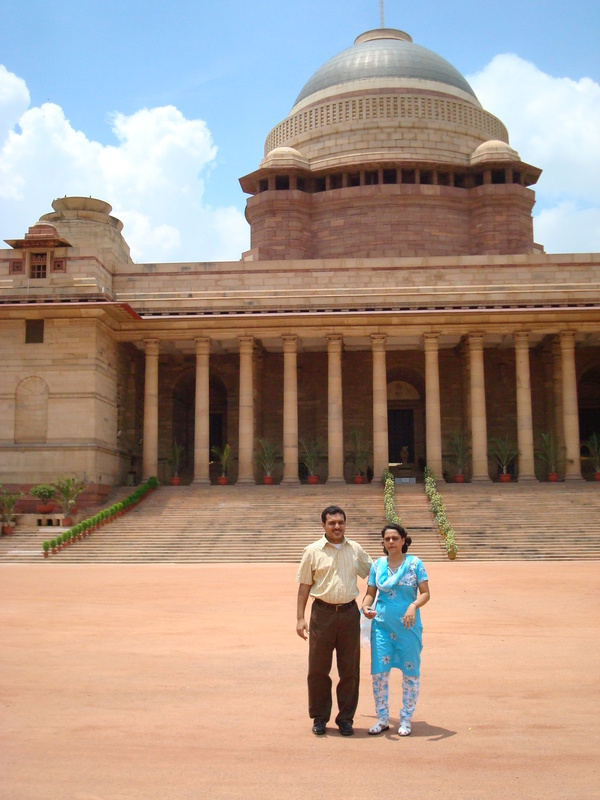 It was from that day that this building was renamed as Rashtrapati Bhavan – the President’s House. The tour starts with The Marble Hall where Statues of King George V and Queen Mary, life size and bust size oil portraits of former Viceroys and Governors General, the silver chair for the Queen, the brass replica of British Crown are displayed. On the basement of this is the Kitchen museum where cutleries and other apparatus used in the kitchen of the Viceroys and Presidents are displayed. We are then guided to the Museum where various gifts given by visiting dignitaries given to the President are displayed. Among things at display is 640 kg silver chair used by the King Emperor at Delhi Durbar of 1911-12. From here we go to the Durbar Hall which has a 2Ton Chandelier . During the British time it was also called the Throne room as the were 2 separate thrones for the Viceroy and Vicereine which have now been replaced by a simple chair for the President,statue of Gautam Buddha belonging to Gupta period, 5 Century, A.D, benedicting from behind. Durbal Hall is used for State functions: Defence Investiture ceremony, conferring of Padma Awards, etc. This is also the place where Lord Mountbatten handed handed over the declaration of Indian Independence to Indias first Prime Minister Sri Jawaharlal Nehru. India Gate is exactly straight from here. The top dome we see from outside of this building houses the Durbal Hall. We went to the Ashoka Hall from here. It was originally built as the State Ballroom.It has a wooden floor,a central dance space, and three vestibules. Unlike most halls and chambers in Rashtrapati Bhawan, the Ashoka Hall has a painted ceiling. The painting is in the Persian style. The main painting on the roof depicts a royal hunting expedition while those towards the corners show scenes from court life. This is where swearing in ceremonies and civilian awards are presented. Adjoining this is the State Dinning Hall, now known as Banquet Hall. It can seat 104 persons. Portraits of all former Presidents embellish its walls. An assortment of medieval arms are also on display through out the walls.